What is Israel’s endgame in Gaza? It is a question that has been puzzling analysts and observers for some time. But belatedly, there are indications of the future Israel and Washington may have in mind for Gaza. Desperately overcrowded, short on basic resources like fresh water, blockaded for eight years by Israel, with its infrastructure intermittently destroyed by Israeli bombing campaigns, Gaza looks like a giant pressure cooker waiting to explode. It is difficult to imagine that sooner or later Israel will not face a massive upheaval on its doorstep. So how does Israel propose to avert a scenario in which it must either savagely repress a mass uprising by Palestinians in Gaza or sit by and watch them tear down their prison walls? Reports in the Arab and Israeli media – in part corroborated by the Palestinian president, Mahmoud Abbas – suggest that Egypt may be at the heart of plans to solve the problem on Israel’s behalf. This month Israeli media reported claims – apparently leaked by Israeli officials – that Egypt’s president, Abdel Fattah al-Sisi, had offered the Palestinian leadership the chance to annex to Gaza an area of 1,600 sq km in Sinai. The donated territory would expand Gaza fivefold. The scheme is said to have received the blessing of the United States. According to the reports, the territory in Sinai would become a demilitarised Palestinian state – dubbed “Greater Gaza” – to which returning Palestinian refugees would be assigned. The Palestinian Authority of Mahmoud Abbas would have autonomous rule over the cities in the West Bank, comprising about a fifth of that territory. In return, Abbas would have to give up the right to a state in the West Bank and East Jerusalem. The plan, which would most likely result in significant numbers of Palestinians moving outside the borders of historic Palestine, was quickly dismissed as “fabricated and baseless” by Egyptian and Palestinian officials. Tayeb Abdel Rahim, a spokesman for Abbas, accused Israel of using the proposal to “destroy the Palestinian cause”, referring to Abbas’ efforts at the United Nations to win recognition of Palestinian statehood on parts of historic Palestine. But Abdel Rahim’s denial raised more questions than it answered. While rejecting suggestions that Sisi had made such an offer, he added that the plan originated with Giora Eiland, Israel’s national security adviser from 2004 to 2006. Abdel Rahim appeared to be referring to a plan unveiled by Eiland in 2004 that Israel hoped would be implemented after the withdrawal of settlers and soldiers from Gaza – the so-called disengagement – a year later. Under Eiland’s terms, Egypt would agree to expand Gaza into the Sinai in return for Israel giving Egypt land in the Negev. Abdel Rahim also stated that a similar plan – the resettlement of Palestinian refugees in Sinai – had been advanced briefly by Sisi’s predecessor, Mohamed Morsi. Morsi, who served as president for a year from the summer of 2012 until his ousting by Sisi in a military coup, headed a Muslim Brotherhood administration that tried to strengthen ties to the Hamas leadership in Gaza. The idea of creating a Palestinian state outside historic Palestine – in either Jordan or Sinai – has a long pedigree in Zionist thinking. “Jordan is Palestine” has been a rallying cry on the Israeli right for decades. There have been parallel suggestions for Sinai. In recent times, the Sinai option has found favour with the Israeli right, especially following the outbreak of the second intifada 14 years ago. Support appears to have intensified after the disengagement in 2005 and Hamas’ victory in the Palestinian national elections a year later. Notably, the scheme became the centrepiece of the 2004 Herzliya conference, an annual meeting of Israel’s political, academic and security elites to exchange and develop policy ideas. It was then enthusiastically adopted by Uzi Arad, the conference’s founder and long-time adviser to Benjamin Netanyahu, the current prime minister. He proposed a three-way exchange, in which the Palestinians would get part of Sinai for their state, while in return Israel would receive most of the West Bank, and Egypt would be given a land passage across the Negev to connect it to Jordan. A variation of the “Sinai is Palestine” option was dusted off again by the right during Operation Protective Edge, Israel’s 50-day attack on Gaza this summer. Moshe Feiglin, the Speaker of the Israeli Knesset and a member of Netanyahu’s Likud party, called for Gaza’s inhabitants to be expelled from their homes under cover of the operation and moved into Sinai, in what he termed a “solution for Gaza”. Given that the rationale of the Sinai option is to remove Palestinians from what the Israeli right considers Greater Israel, and such a plan is vehemently opposed by all Palestinian factions, including Hamas, why would Morsi have backed it? Further, why would he have proposed giving up a chunk of Egyptian territory to satisfy Israeli ambitions, thereby undermining his domestic credibility, at a time when he was fighting for political survival on many other fronts? One possibility is that Abbas’ office simply made up the story to discredit Morsi and the Muslim Brotherhood, and by extension Abbas’ political rivals in Hamas, and thereby win favour with Sisi. But few Palestinians or Egyptians appear to have found the claim credible, and Sisi has shown no interest in pursuing this line of attack against Morsi. Why would Abbas fabricate a story that might rebound on him by linking him to such underhanded diplomacy by Egypt, Israel and the US? There are two further pieces of the jigsaw suggesting that there may be more to the Sinai story than meets the eye. The first are comments made by Abbas shortly before the Israeli media began reporting the alleged offer by Sisi. Abbas was responding to earlier rumours that began in the Arab media. Abbas signalled at a meeting with Fatah loyalists on 31 August that a proposal to create a Palestinian state in Sinai was still of interest to Egyptian officials. The Times of Israel website said it had subsequently confirmed the comments with Abbas. The second clue was provided in a barely noticed report in English published last month on the website of the Arab newspaper Asharq Al-Awsat, headquartered in London but with strong ties to the Saudi royal family. It claimed that in the later years of his presidency, Egypt’s Hosni Mubarak came under concerted and repeated pressure from the US to cede territory in Sinai to the Palestinians to help them establish a state. The article, based on information reportedly provided by an unnamed former Mubarak official, stated that pressure started to be exerted on Egypt from 2007. In Mubarak’s view, according to the report, Israel hoped that, once Palestinians were on Egyptian soil, the combined area of Sinai and Gaza would be treated as the Palestinian state. This would be the only territory to which Palestinian refugees would be allowed to return. Anticipating later statements by Abbas’ office, the Egyptian source said a similar proposal was put to Morsi when he came to power in 2012. A delegation of Muslim Brotherhood leaders travelled to Washington, where White House officials proposed that “Egypt cede a third of the Sinai to Gaza in a two-stage process spanning four to five years”. US officials, the report stated, promised to “establish and fully support a Palestinian state” in the Sinai, including the establishment of seaports and an airport. The Brotherhood was urged to prepare Egyptian public opinion for the deal. So what sense can we make of these various pieces of the jigsaw? Each in itself can be discounted. The Asharq al-Awsat report is based on an anonymous source and there may be Saudi interests at work in promoting the story. Likewise, the Israelis could be waging a misinformation campaign. But taken together, and given that Abbas appears reluctantly to have conceded key elements of the story, it becomes much harder to ignore the likelihood that the reports are grounded in some kind of reality. There seems little doubt – from these reports and from the wider aspirations of the Israeli right – that a Sinai plan has been crafted by Israel’s security establishment and is being aggressively advanced, not least through the current leaks to the Israeli media. It also looks strongly like variations of this plan have been pushed more vigorously since 2007, when Hamas took exclusive control of Gaza. Israel’s current rationale for the Sinai option is that it undermines Abbas’ intensifying campaign at the United Nations to seek recognition of Palestinian statehood, which Israel and the US adamantly oppose. It also seems plausible, given the strength of its ties to Israel, that the US is backing the plan and adding its considerable weight to persuade the Egyptian and Palestinian leaderships. Harder to read, however, is whether Egypt might have responded positively to such a campaign. This is true enough. So what leverage do Israel and the US have over Egypt that might persuade it to override its national security concerns? Aside from the large sums of military aid Washington gives to Egypt each year, there is the increasingly pressing matter for Cairo of dire fuel shortages, which risk inflaming a new round of street protests. Israel has recently discovered large offshore deposits of natural gas, which is it is ready to export to its neighbours. It is already quietly agreeing deals with the Palestinian Authority and Jordan, and is reported to be in advanced discussions with Egypt. 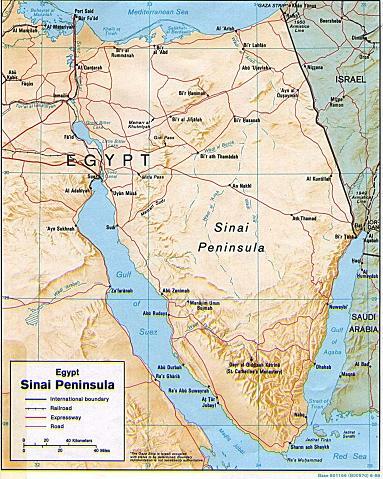 Is this part of the pressure being exerted on Egyptian leaders to concede territory in Sinai? And has it been enough to make them overlook their security concerns? Finally, there is the Palestinian leadership’s role. Abbas has said firmly he will not countenance such a deal. How might Israel think it could change his mind? One controversial possibility, which throws a very different light on the events of this summer, is that Israel may hope it can “soften up” Palestinian opinion, especially in Gaza, by making life even less bearable than it already is for the population there. It is noticeable that Israel’s large-scale operations attacking Gaza – in the winter of 2008-09, 2012 and again this year – started shortly after, according to Asharq al-Awsat, Israel and the US began turning the screws on Mubarak to concede part of Sinai. The massive and repeated destruction of Gaza might have an added advantage for Israel: it allows Cairo to cast its offer of a small slice of the Sinai to the Palestinians as a desperately needed humanitarian gesture. The success of Israel’s approach requires isolating Gaza, through a blockade, and inflicting massive damage on it to encourage Palestinians to rethink their opposition to a state outside historic Palestine. That precisely fits Israel’s policy since 2007. The Sinai option may be difficult to confirm at this stage but we should keep it firmly in mind as we try to make sense of unfolding events in the region over the coming months and years.